The HAUG ring ionizer is a highly effective production aid for the discharging and cleaning of surfaces – in particular of non-conductive materials. Beside the hand-held unit, other versions are available for installation into plants and machinery (without air gun). 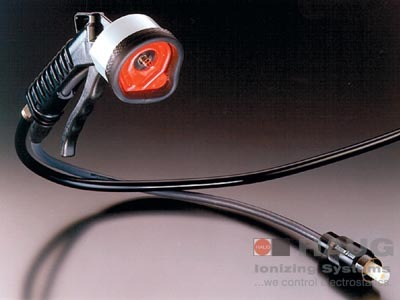 The ring ionizers are simply connected to a HAUG high-voltage power pack. Power packs are available for a variety of mains voltages and can be specified to have two or four high-voltage connections. The HAUG Multistat power pack is particularly recommended for this application. This fully electronic unit includes an integrated electronic fault and performance monitor ensuring a high and consistent standard of quality. This ring ionizer is light, but robust and easy to handle. Its ergonomic design ensures that this unit is easy to use. There is a direct correlation between dust and electrostatic charges. Plastic moldings, films and foils, optical and electronic components, plastic sheets, etc. often show surface charges which cannot be eliminated electrically due to highly insulating material properties. The resulting electrostatic charges on the surface attract dirt and particles suspended in the environment. This leads to a reduction of the surface cleanliness and hampers further processing. Regular use of the special cleaning agent SRM 1 and of the cleaning kit RS 1 will also ensure a consistently high effectiveness. The use of a service unit (compact filter control valve) for the pretreatment of the air is indispensable. It is intented to separate any oil and water content, and it also allows the operating pressure to be regulated. For particular applications service units with ultra-fine filters can be supplied.